It has been a month since the school shooting at Stoneman Douglas High School, but the public is still reeling from the tragedy. To remember the victims and prompt action to prevent future school shootings, the community created a memorial at the school. Over spring break, FSC student athlete Anna Brook Opalinski visited the memorial twice with her family. Opalinski lives in Ft. Lauderdale and is very familiar with Stoneman Douglas. In high school, Opalinski frequently competed against Douglas on their track and at other competitions. “They were always one of our biggest competitors,” Opalinski said. This personal connection with the school prompted her to visit the memorial with her parents. She parked in the field where students and parents waited during the shooting for news or to be reunited with their children. Members of the community piled flowers for each victim in front of the school. In addition, several victims had symbols of their religion placed above their names. Opalinski said when she visited the school, it did not feel real at first. It felt like a news story. She said she suddenly felt an intense hopelessness. Among the signs, there were large posters of the victims’ faces. Opalinski said that was the image that brought her to tears. Despite the obvious sorrow surrounding the memorial, there was also a reason to feel pride present. Opalinski said that seeing all of the people not just locally but from all over the world show their support by making the trip to leave tokens of their support at the memorial was inspiring. For that reason, Opalinski felt that FSC should be represented with the others. 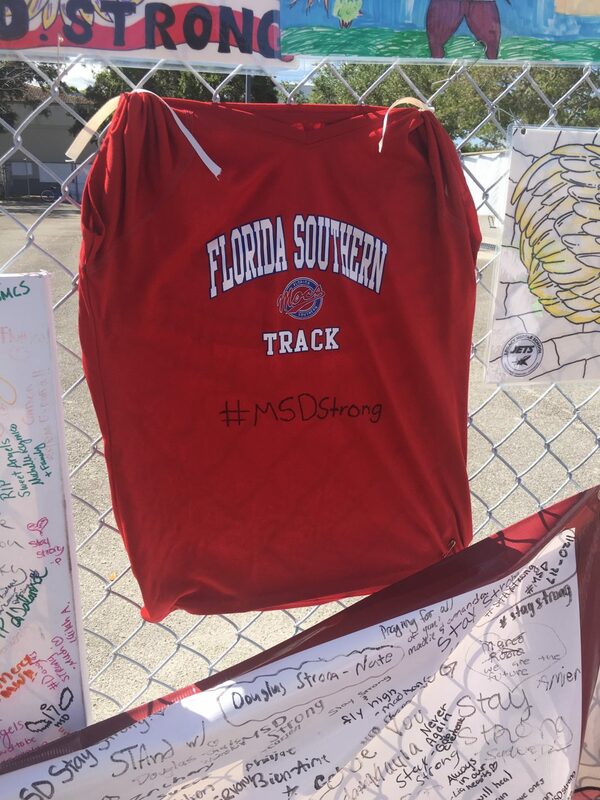 After her initial visit to the Stoneman Douglas High School, she returned to place an FSC track and field t-shirt on the fence amid representation from several other universities. On the shirt, she wrote #MSDstrong. The nation has responded to this tragedy in support of the students, faculty and families of Stoneman Douglas High School with a powerful drive towards gun control. Student survivors of the shooting have organized awareness events and spoken out openly on the news and social media to voice their discontent over current gun regulations. There has been an outcry for stricter gun control laws to help prevent school shootings and make students feel safer when they are in school. Florida lawmakers have been under mass scrutiny since the shooting at Stoneman Douglas, causing them to raise the legal age to buy a firearm from 18 to 21. For those speaking out against gun violence, this will not be enough to stop the efforts they are making to ensure a safer environment. One such statement against gun violence was the walkout on March 14. Across the nation, thousands of schools walked out of school during the day and stood outside for seventeen minutes – one minute for every victim. 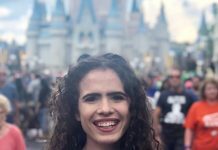 Since the Stoneman Douglas shooting, students have been spearheading the fight for gun control. They have been actively speaking out about not feeling safe in school and how it is the responsibility of our legislators to ensure student safety. More events such as the walkout are being planned by countless communities so that more people can get involved and show their support for the students.